Musings of an ADHD mind. Two of the Big Guy’s favorite things are blueberries and cheesecake. I wanted to make him something special for Valentine’s Day. 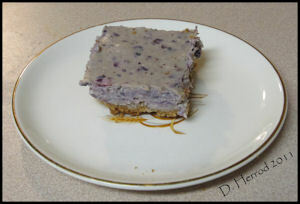 I adapted this recipe Epicurean Mom’s Berry Cheesecake Bars. Combine ingredients in a small saucepan. Simmer for about 10 minutes until syrupy. Set aside. Preheat oven to 325 degrees. Grease a square baking pan (8×8 or 9×9) with butter. Cover pan with parchment leave some extra on top. Should be enough to lift finished bars from pan. Crumble graham crackers into food processor, pulse until it resembles course crumbs. Add the remaining ingredients, pulse until combined. Press cracker mixture into pan Bake for 12-15 minutes or until set. Combine all ingredients in the food processor. Pulse until well combined and smooth. Pour into mixing bowl. Fold in blueberries. Bake 35-45 minutes until set. Cool for 3 hours in fridge or 1-2 hours in freezer. Remove from pan and cut into bars. That looks like a great sweet treat! It was and very easy. TheDeeZone on No. Just No. gypsygirly on No. Just No.